Last spring was memorable for many reasons. One of my favorite persons turned 50 and we wanted to be part of the celebrations, so we flew out to Massachusetts for the party. It soon turned into a working vacation and the intense hours at work were balanced by food, fun, friends and family. We returned home a couple of weeks later, late at night, feeling very content. I turned on the lights in the yard to peek outside and everything was a lush green. I went to sleep very happy that night. The nightmare began the next morning when I realized that we had no grass. The green that I had seen was dandelions, more dandelions and even more dandelions. Our neighbors weren't particularly thrilled either. We bought weed pullers and yanked away till we only had holes for a yard. I bore the brunt of refusing to consider townhomes when we were house-hunting but I was so done with sharing walls and second-hand smoke. After a while we gave up doing things the Boulder way and I went and bought Weed-B-Gone and started spraying every dandelion cluster I saw. Did I mention that I hate dandelions? Yet, a couple of months later I ate dandelion greens sautéed in olive oil with some garlic at a friend's place and really enjoyed them. Ever since then I have been looking for a recipe that would work really well with dandelion greens. I knew I had found it when I saw this. And when I found a pretty bunch of red dandelions at Wild Oats yesterday, I knew the time had come to try it out. Since Anita is still keeping some secrets when it comes to haakh and sharing only with some others who are subsequently getting their revenge by pulling out the asparagus card, I figured I would follow Chandramukhi Ganju's recipe for munji haakh. I took some hints from Bee's method because unfortunately, Ms. Ganju forgets to tell us when to add asafetida as well as the garam masala. Before I go any further, I must tell you a little bit more about dandelion greens. 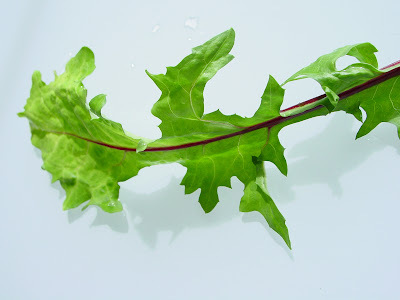 Regular dandelion greens are only slightly bitter and have a flavor rather like mulyachi bhaji made with the greens of white radish. Red dandelions? 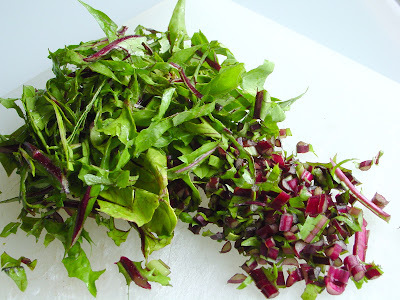 If you hate karela, you will detest red dandelion greens with a vengeance. They surpass bitter melon or bitter gourd in the bitter department. Oh, and, I loved these dandelions. Release the pressure as quickly as possible, keeping your safety in mind, and open the pressure cooker. Add Kashmiri garam masala and mix well. Cook for another minute or so and serve hot with naan or, to appease Anita, have it with starchy short-grained rice. What can I say? It was bitter personified but I loved it. Medha wanted it off her plate as soon as possible but she did taste it. My husband and I relished it over the next few days. 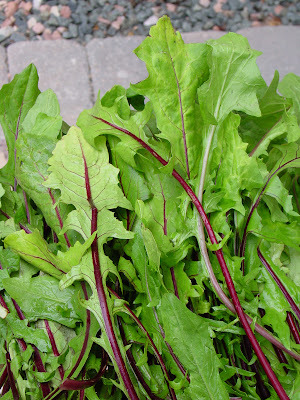 There is a side effect that we weren't quite aware of the first night we ate these: dandelion greens clean out your system better than spinach. Uh huh! I have never had garam masala in my Haak! With Naan!! Horror of horrors! And it is time the real munji haak stood up. I would have posted it long ago had I even an inkling of the fact that it might actually please non-Kashmiris, relying as I was on TH's family's response. Tee! Hee! you mean you might actually do a post on Haak?! No! If Kashmiri Var or Kashmiri Vari Masala is different from Kashmiri garam masala, how is this poor soul to know?! And, it was yum with naan. They soaked up all the delicious juices. So what do Kashmiris make with dandelions? I have the vaguest memories of my grandma (dadi) collecting dandelion like greens when we visited my Uncle posted in Bandipora (Kashmir), far from the city. There was also a grat (water-mill)there from which we got some rice flour...I was maybe 10 - so you'll have to forgive me if I don't remember what was made of the greens. Maybe they didn't even serve it to us kids...relishing all that bitterness by themselves. But, this needs further investigation,definitely. Lmao!!!! ...cleaned out your system...lol....Medha wanted them off her plate..lol...OMG! You kill me! LOL...Maybe she'll finally do a post! And Pel is the proverbial fountain of knowledge...really! Is there anything about Indian cuisine that he does not know? Thts a fun read.. But are those dandelions in yr yard edible? Enjoyed reading your post Manisha. The recipe looks really simple and nice. Dandelions look familiar. <looks left; looks right; wonders what will hit her next and from which direction> Psst! Pel! Is she being nice to be me now? I was contemplating shutting shop, I mean blog. She scared the Ba-Krishna out of me! Pel, you have some globe thistle planted or you have some growing just because? And this is not an obnoxious weed? Suganya, the dandelions from my yard are not edible. I have sprayed them to ...well, I wish I could say death! 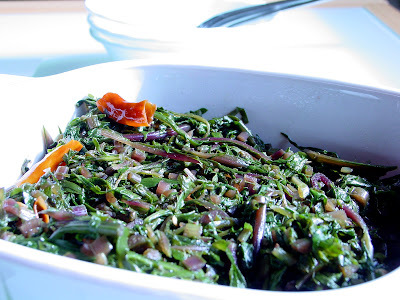 The greens I used in this recipe are organic red dandelion greens. These are newly cultivated variety and have red stalks and red veins. I found these at Wild Oats. 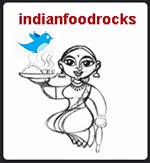 Archana, it is simple although the flavors are far from it! what has the world come to? one has to buy dandies? my neighbour has the most unkempt yard in the world and i can get some organic dandies for from there for free. your dish looks fab. i'm too drunk right now, but i'll be back home tomorrow evening and then i'll probably wonder who posted this comment in my name. ask you to delete this comment. See now, that's what I needed! A chaap of authenticity from the other tip of India! In Boulder, you'd think we wouldn't have to buy organic dandelions but the only yard that I could get them from in my neighborhood has a lot of dog poop. So no thank you! Have a safe trip home and I hope your vacation was fun! Anita will just have to understand that the haak-method and it's simple seasoning is specatacular for anything green... ooooh! Broccoli!!! I really want you to look at this amazing Kashmiri Tea pink . I loved making it and I am sure you will also like it. One thing that I would like to add, I am a huge fan of you website. You people do things with careful thought. I think I will stick with you for a long time.